He studied viola with Fabrizio Merlini and Piero Farulli, and violin with Enzo Porta and Anna Bonomelli. At the “Accademia Chigiana di Siena” he did high-level viola course with Juri Baschmet. 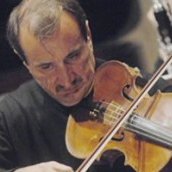 The Amadeus Quartet and Piero Farulli inspired him to specialize in quartet playing, which he teaches at the “Conservatorio Paganini di Genova”. He performs with the “Dedalo Ensemble di Brescia” and collaborates with the well known “Quartetto Borciani” and “Quartetto di Cremona”. He has researched the physical problems inherent in string playing, collaborating with “Orchestra RAI di Torino”, “Università di Genova” e “Fondazione Don Carlo Gnocchi di Milano”. Coach in “Body techniques” for string players in different Italian conservatories, he includes biomechanical and myofascial principles in his teaching.